Sweet Moment. 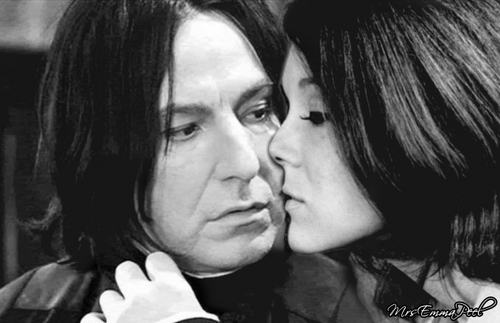 Emma Peel giving Severus Snape a kiss. I couldn't resist. My two inayopendelewa actors and characters so I thought it would be cute to make it. Plus Snape needs a kiss. This is my way giving him one.. Wallpaper and background images in the Diana Rigg club tagged: diana rigg emma peel severus snape mrsemmapeel fan art. This Diana Rigg fan art might contain picha, headshot, and closeup. upinde wa mvua au Aura? Awww this is so lovely ! lol! Great job, but Severus doesn't really look like he's welcoming the attention. If I was him... lol! Thank you, Sharon. LOL!!! Thats so like Sev not welcoming it. He's not really that nice of a guy. Really moody. I kind of like to think he was caught by surprise when Emma gave him some sugar on the cheek. lol.